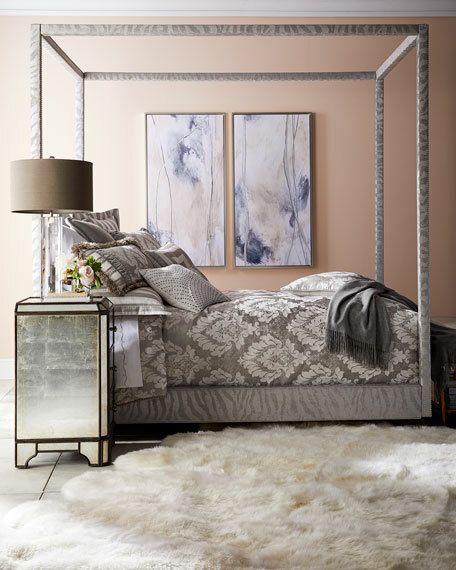 This gorgeous mirror option is a perfect compliment to the Eglomise bedroom or can be a featured accent in any room. 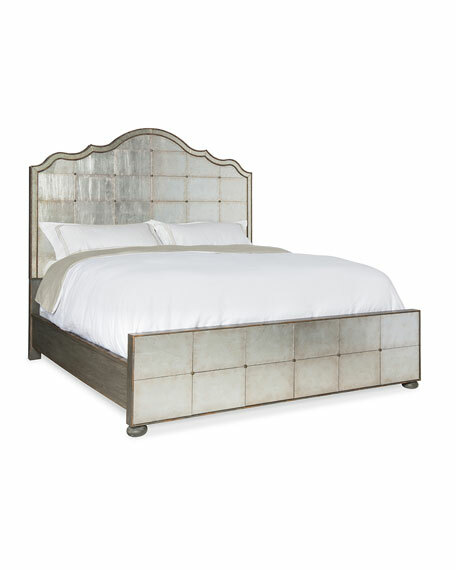 The metal wrapped frame has a tiered effect for added dimension along with a beveled mirror glass. 36"W x 2.3"D x 36"T.
Weight, 35.2; Boxed weight, approximately 52.8 lbs. 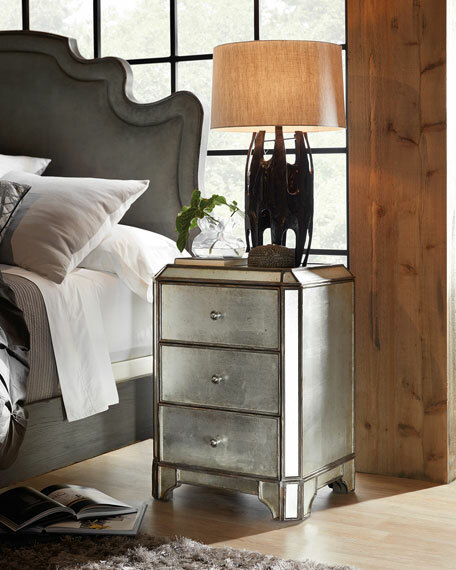 Glam meets industrial with a hint of French influence in this show-stopping bed. 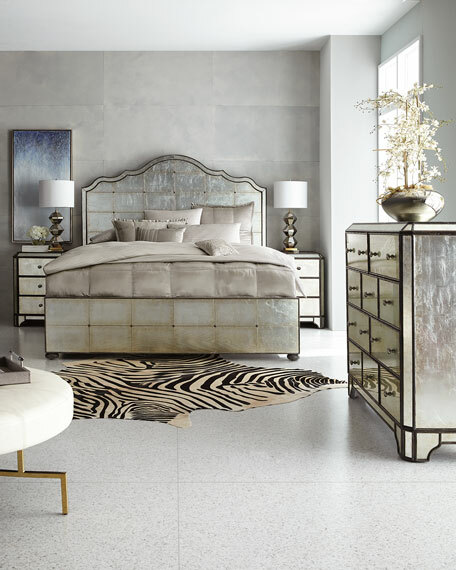 The headboard and footboard feature individual hand laid Eglomise mirrored pieces to create a stunning visual impact. 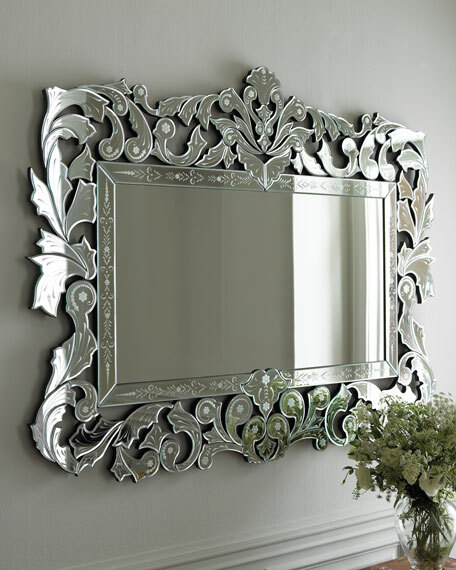 The silver hand painted mirror pieces are complemented by metal buttons which add stability and additional dimension to the pieces. 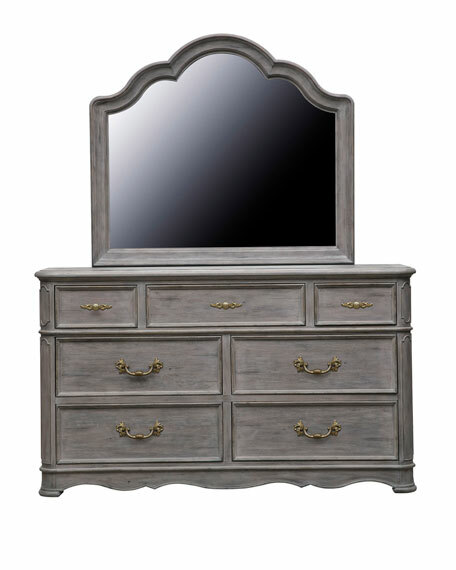 65"W x 88.5"D x 70.5"T.
Assembly instructions and hardware and instructions included. 81"W x 92.5"D x 73.75"T.
Boxed weight, approximately 393 lbs. 81"W x 88.5"D x 73.75"T.
Boxed weight, approximately 373 lbs. 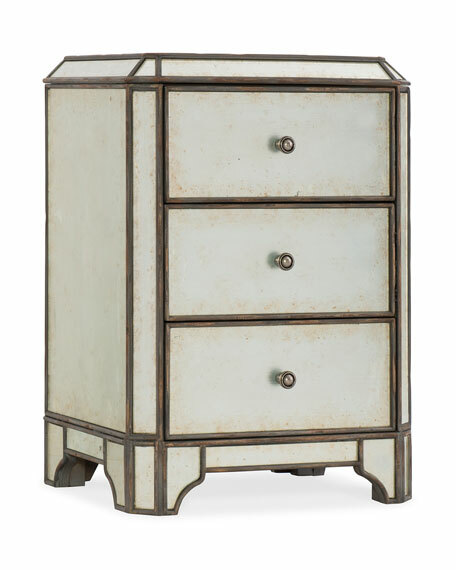 This fabulous three-drawer nightstand utilizes a hand painted silver eglomise with distressed elements to create a gorgeous silhouette. 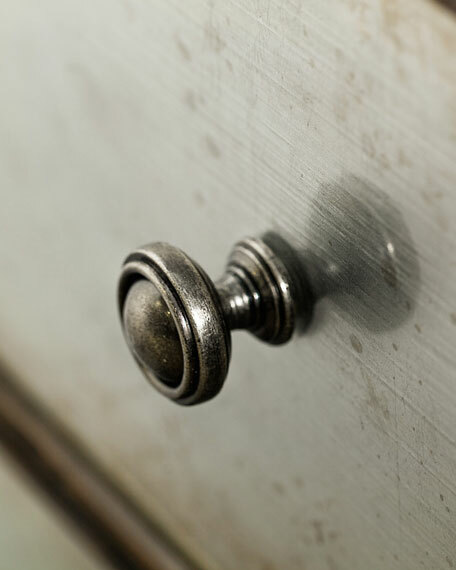 Highlighted by metal accents along the frame and simple, metal drawer pulls afford an industrial vibe. 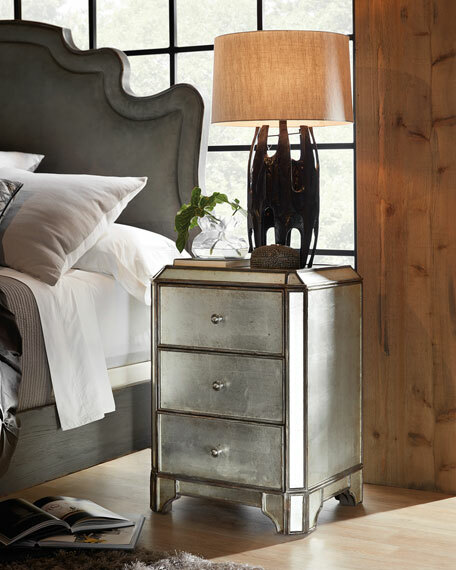 Handcrafted nightstand with distressed charcoal wood finish. 22.5"W x 19"D x 32"T.
Top drawer has drop in felt liner for delicate items. Back features one live USB port and 3 electrical outlets. Underneath lighting with touch switch on each side of nightstand and cord clip on back of piece. 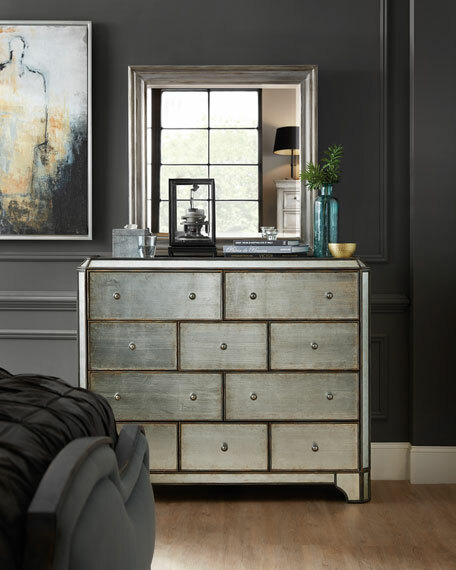 This 10-drawer bureau utilizes a hand painted silver eglomise with distressed elements to create a gorgeous silhouette. 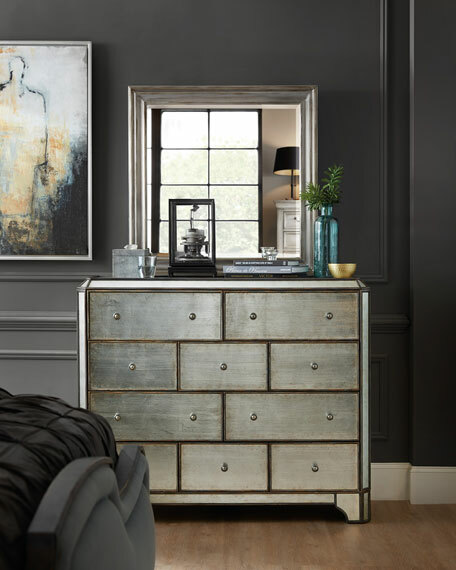 Highlighted by metal accents along the frame and simple, metal drawer pulls afford an industrial vibe. 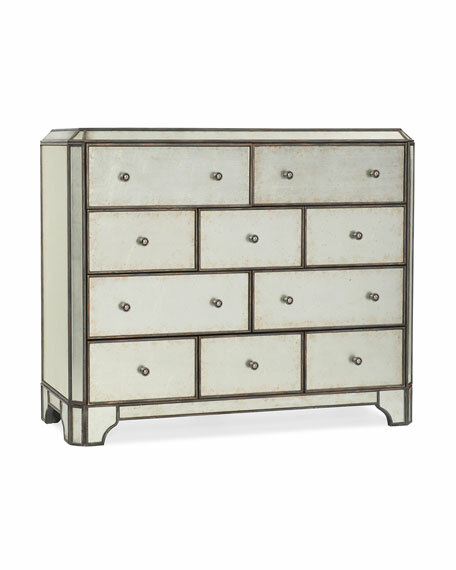 Handcrafted 10-drawer chest with hand painted silver surface. Top left drawer has drop down drawer front and felt liner for an entertainment option. Top right drawer has removable felt liner and 3 bottom drawers are cedar lined. 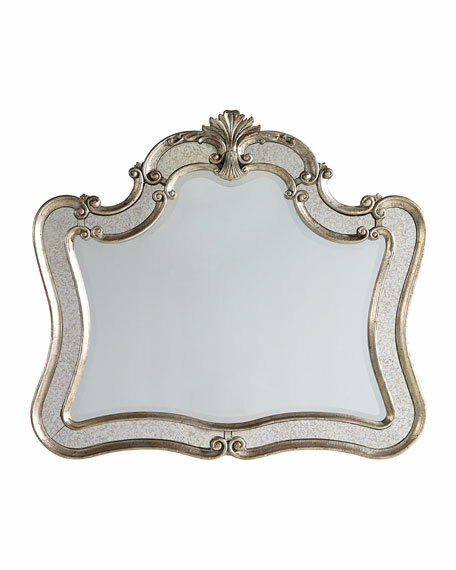 52.5"W x 20.3"D x 44"T.
EXCLUSIVELY OURS.Venetian-style mirror.Made of intricately hand-cut glass decorated with wheel engraved designs. 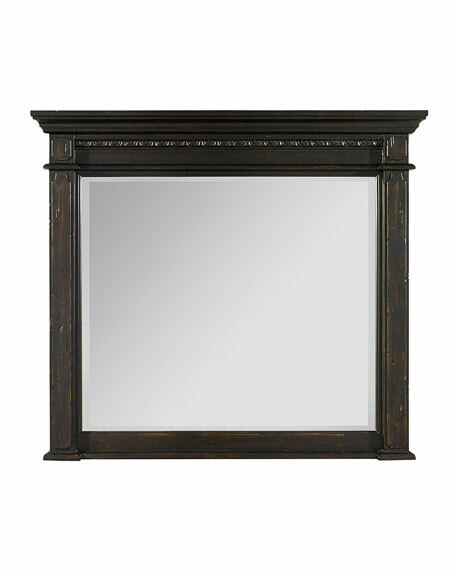 Center mirror is 46"W x 26"T. Overall dimensions, 62"W x 47"T. Imported.Boxed weight, approximately 79.8 lbs. 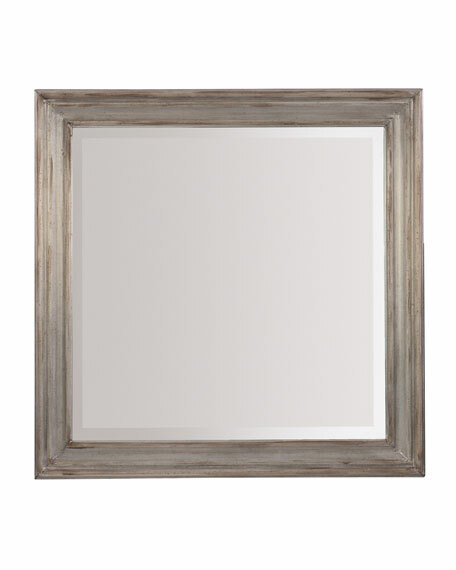 Italian Renaissance-inspired design.Mirror has beveled glass, beaded moulding, and raised motifs.Frame made of spruce solids and pine veneers.Distressed finish.48"W x 3.75"D x 40.5"T.Imported.Weight, 50.6 lbs. Boxed weight, approximately 57.2 lbs.